From 2015 to 2016 SPIN network partners have implemented the project European Sport Inclusion Network (ESPIN). This European sport project was aimed at promoting equal opportunities of migrants and minorities through volunteering in sport. The project has now been selected as a "success story" by a panel of experts from the Directorate-General for Education, Youth, Sport and Culture of the European Commission. “Success stories “are finalised projects funded through the ERASMUS+ programme that have distinguished themselves by their impact, contribution to policy-making, innovative results and/or creative approach and can be a source of inspiration for others. The project has been marked as "success story" in the Erasmus+ Project Results Platform, a database where one can find descriptions and results of projects supported by the European Commission under the Erasmus+ Programme for Education, Training, Youth and Sport, as well as its predecessor programmes. 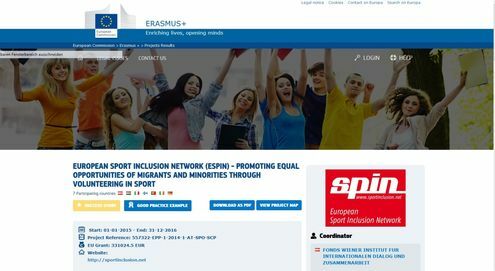 SPIN network partners from 7 countries have developed a new project called “Sport Inclusion of Migrant and Minority Women - Promoting sports participation and leadership capacities”. The project has been submitted to the European Commission in April 2018. 24-11-2018 A Europa está preparada para a integração de migrantes e refugiados?